A sweetly appealing gift book that explores the joy of being a child, and of being a mum. 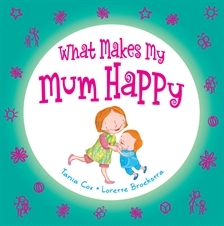 What makes Mum happy? When I start her day with breakfast on a tray; when I make her a crown to wear into town; when she watches me dance, skip, hop and prance. What makes your mum happy? A sweetly appealing book for mothers and children to share together.